A scenic ride on ICE, from Frankfurt to Köln, going past Koblenz along the river Rhine. A day and half earlier, I had communicated via mail to Mahesh that i will most probably reach Cologne by 12:30pm. I did not have a cell phone. I get out of the train with my 23 + 8.something kilograms of luggage, and see this guy with a huge grin walking towards me. It was great to catch up with a college buddy after a really long long time, and in most unexpected of places. Just about a couple of years back, we were chatting at IISc air strip, and now we were catching up in Cologne! 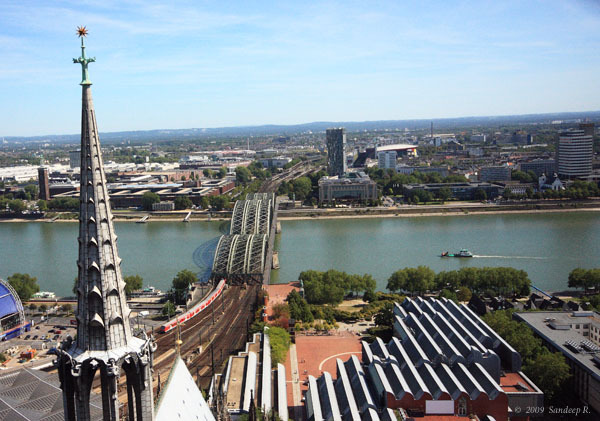 We dropped our luggage at a pre-paid counter – costs about 2 euros for 24 hours, and set out to explore Cologne in the few hours I had before continuing on my journey. 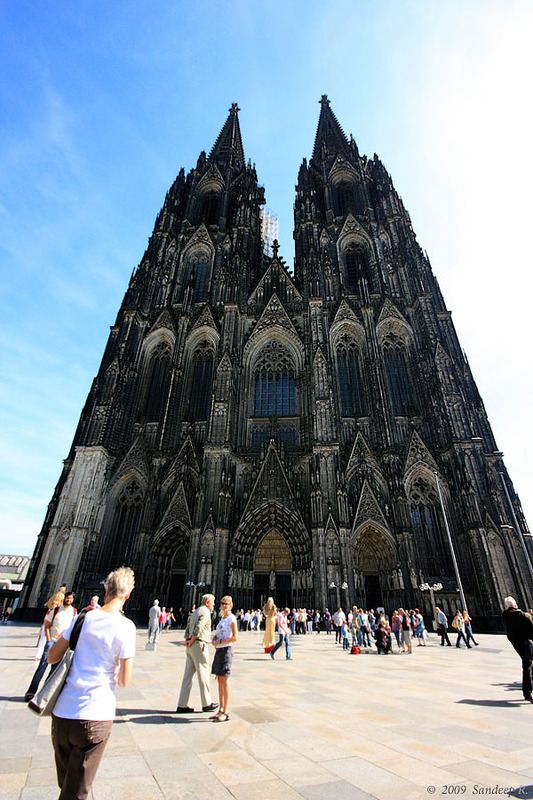 Just outside the Cologne station is this huge, mammoth structure – Kölner Dom or Cologne Cathedral. I had never seen such huge man-made structure. Built over 600 years, this monument at one time was the tallest structure in the world. 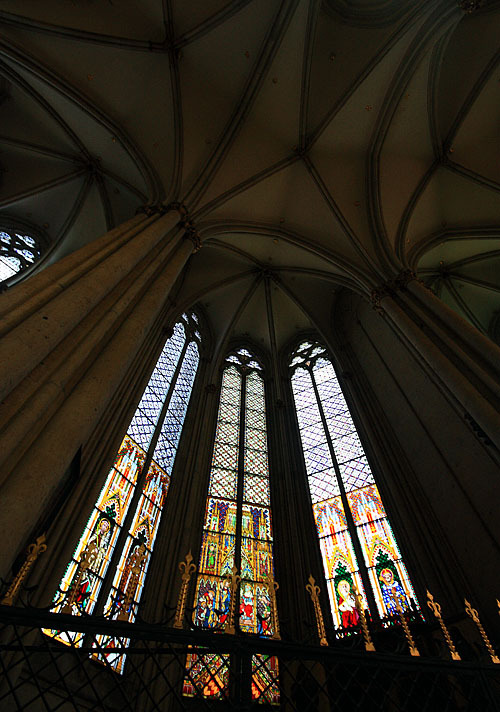 The Cathedral is epitome of Gothic architecture, and was built to keep the faith of people in Christianity. The craftsmanship reminded me of our own Hoysala temples of Belur. 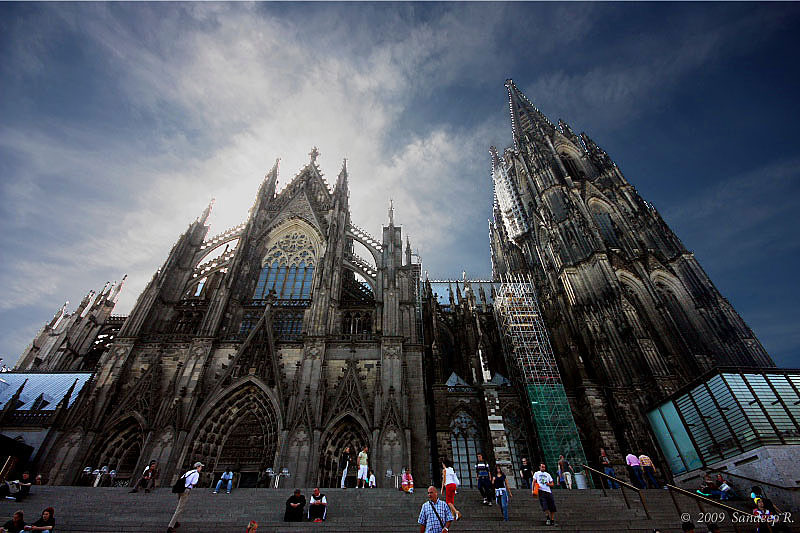 Unlike Hoysala temples, which were in parts destroyed as the territories were concurred by rulers of different faith, the Cologne Cathedral is unscathed to a large extent – signifying the solidarity of Christianity in Europe. Spent some time inside the cathedral, appreciating the Gothic design, sculptures and magnificent stained glass windows. Next, we decided to scale this tower. At the top of the tower is the world’s largest free swinging bell, St. Petersglocke, which fortunately wasn’t ringing at that time. The walls inside the church have zillions of scribblings of visitors from across the world. I decided not to leave any mark of my presence in that way. The climb was exhausting, but the view of the city from the top was exhilarating. Photo courtesy of The Rocketeer, who found these photos in a book bought at a Public Library sale! After the tiring climb, we went to one of Cologne’s oldest breweries to refresh. Früh am Dom, brewery located near the cathedral was our stop for Kölsch. Kölsch bier, exclusive to Cologne is served in Kölsch-Stange, and a must try when you are in Cologne. You get non-alcoholic Kölsch as well. Unfortunately, the dungeon was closed the day I visited, and we settled outside. Visit to the chocolate factory was very tempting, but we did not have the time. It would have not been possible to spend few hours at Cologne, and have vegetarian food for lunch if Mahesh was not along. Thanks a lot dude! It would also have not been possible to share these images if not for Sam, who lend his Sigma 10-20mm lens for my trip. Thanks Sam! 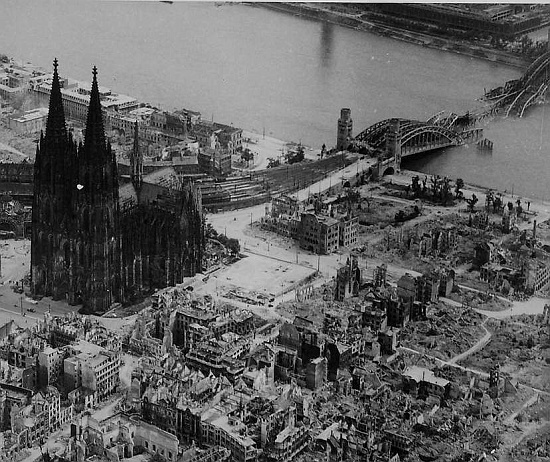 It would also have not been possible to take the fantastic train journey from Frankfurt to Eindhoven, changing 4 trains with a rather long stop at Cologne, and brief stops at Mönchengladbach, and Venlo before arriving at Eindhoven if not for Sudhir, who suggested to take the scenic route along the Rhine river valley and planned the route. 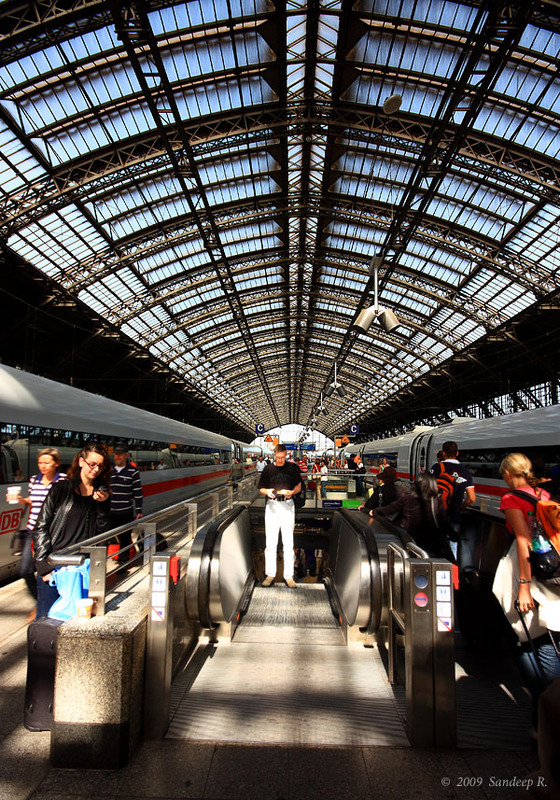 DB Bahn – German railway website is very useful for planning your journey across Europe. 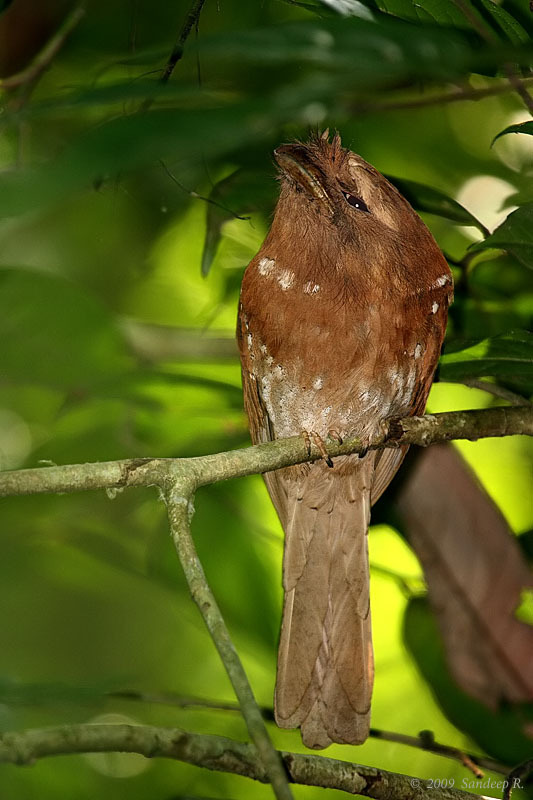 A Brown-fish Owl perches close to your jeep at 6:40pm, on a cloudy monsoon day. You obviously can’t expect an owl to make an appearance in bright sunlight. 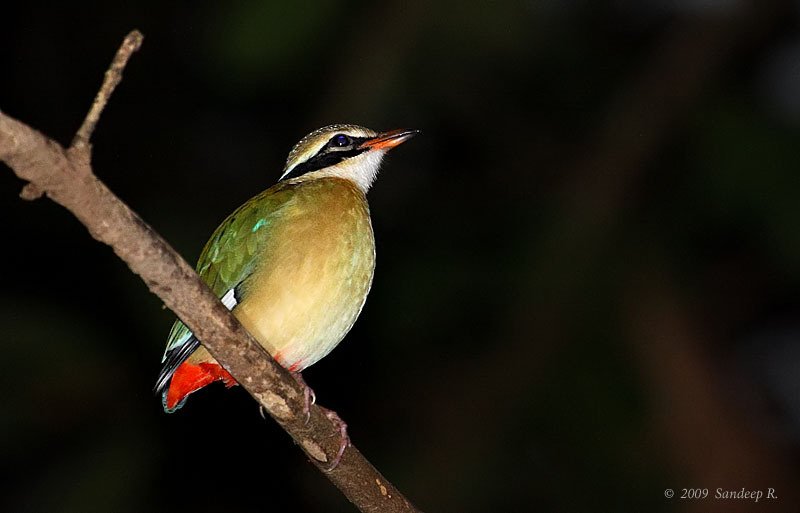 Wildlife photography in Indian jungles (all tropical jungles perhaps) is more challenging because of low light. So, what is the work around? One, faster lenses such as 400mm f/2.8. Two, newer generation of low noise at high ISO cameras. But what if you are not a rich guy (like me)? 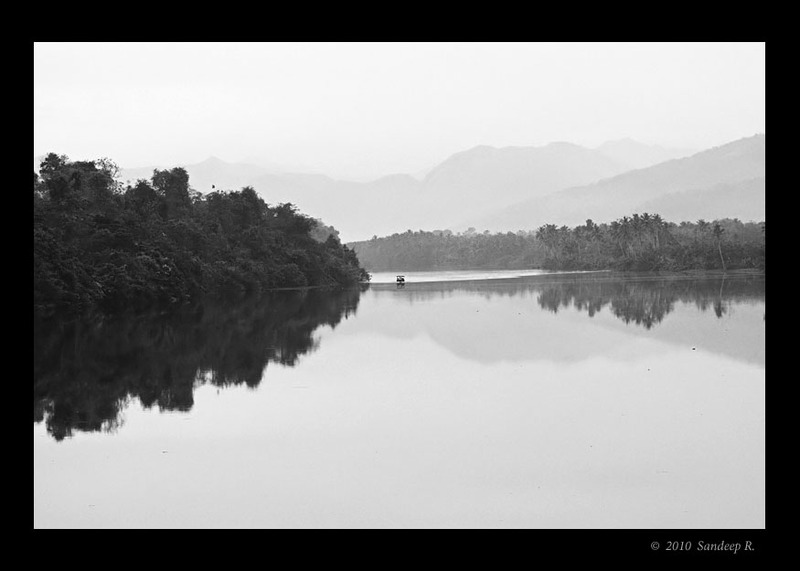 One, accuse good photographers that their images came from better lenses and better cameras. Two, try to make better of what you have. Let me take the latter route. 1. Use whatever form of support that is available. Seat of the jeep or support of the metallic bars. 2. Under-expose the image by 1-2 stops and recover the image in the post-processing. 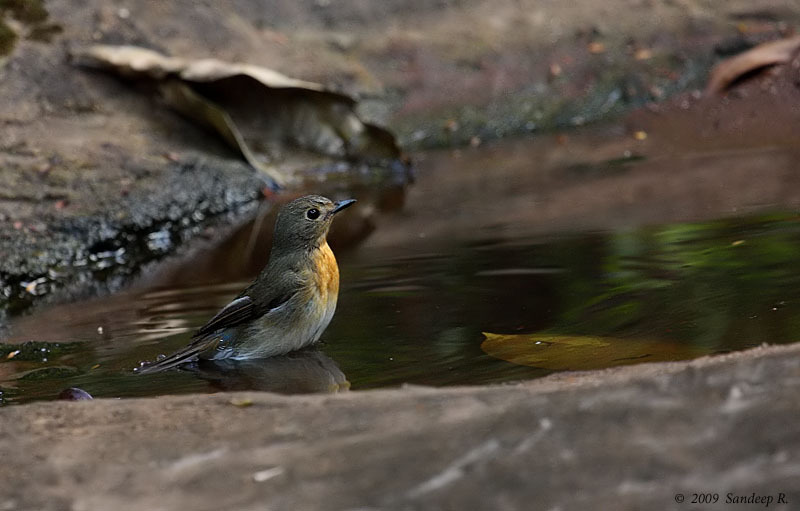 Using the right metering is vital in exercising these techniques to get the right exposure. 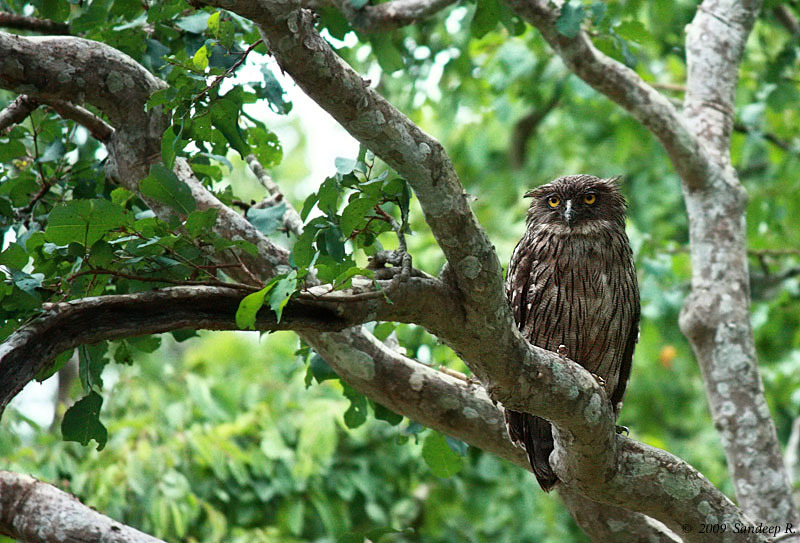 This Brown-Fish Owl perched on this tree when we were watching a herd of Gaurs near a water hole in Bandipur. 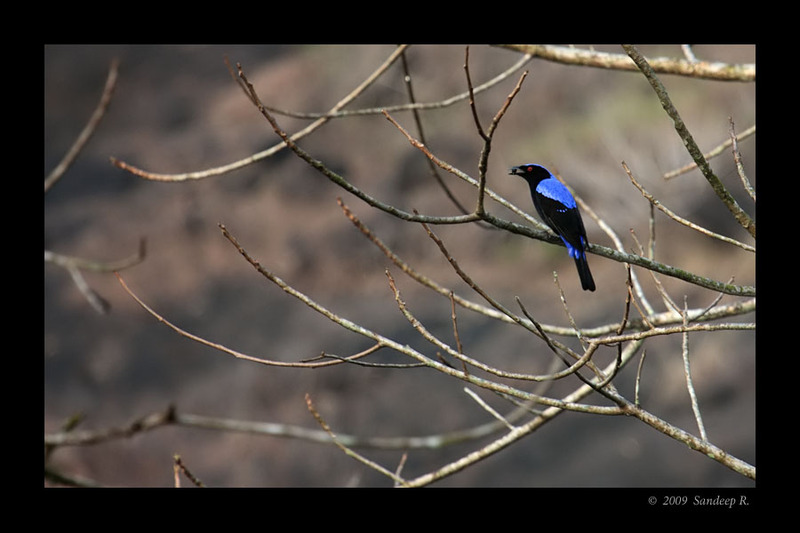 The bird was close enough for my 55-250mm IS lens. It was pretty dark. I underexposed by nearly 2 stops at ISO-800 to get 1/13s shutter speed on Partial metering. I took the support of jeep window to hold the camera steady. I recovered the image as I wished, albeit little noise. This is a full frame image at 250mm. Had I put my hand out of the jeep, I might have caught this bird. This is what monsoon does to most wildlife. They sit idle and don’t care much. ISO-200, 1/10s shutter speed. I did not underexpose more than I wanted. Barely any post-processing. Evaluative metering. I took the support of jeep seat to get the required stabilization. Holding the camera steady for slower shutter speeds is the key for getting sharper images in low-light. While on jeep safari, carrying tripod is not always an option whereas carrying a monopod or a bean bag is. Fill-in flash is also helpful to get faster shutter speed, but keeping the interest of subject in mind avoid it as much as possible. Neat Image helps to reduce noise, but I can’t afford the software at present. If you have some more techniques to share or wish to make donations for me to but a f/2.8 lens, feel free to contact me. P.S. 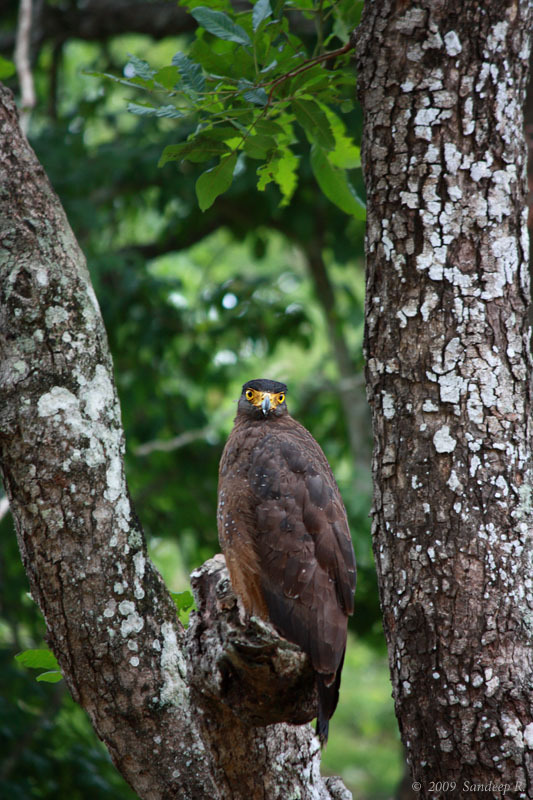 : Thanks to JLR Bandipur drivers, Kiran for Brown Fish Owl image, and Ramesh for Serpant Eagle image.